Meredith Corp released its Q2 2019 revenue report earlier this week, reporting total company revenues that have more than doubled compared to the year prior and improved advertising numbers within its National Media Group. Total company revenue culled from continuing operations more than doubled to $854 million, along with total advertising- related and consumer-related revenues that brought in $489 million and $337 million, respectively. Across its National Media Group, which includes its stable of legacy publishing titles, Meredith Corp reported revenues of $591 million, an increase of 140% from the year prior. That number excludes former Time Inc. operations Time, Fortune, Sports Illustrated, Money and Viant, each either sold or in the process of closing sale.s. Though it didn’t report numbers, the company reports that it delivered improved sequential comparable advertising revenue performance in Q2 and anticipates significant improvement through the rest of fiscal 2019. As it works towards further integrating its acquired Time Inc. titles, Meredith Corp has set forth several strategies. First up, the company will leverage the increased scale of its combined digital portfolio to enhance sales initiatives, as it works to aggressively grow revenue and raise the profit margins of its acquired digital properties. 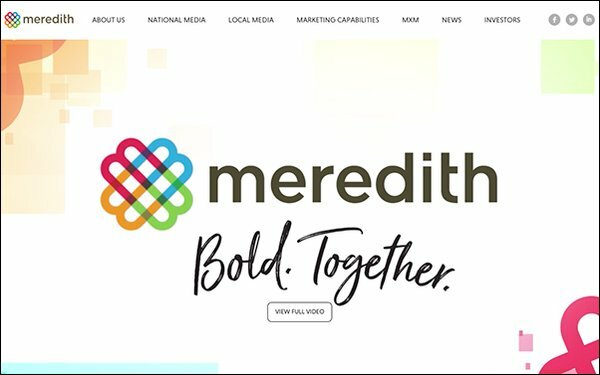 Helping with this is Meredith’s fast-growing advertising platforms that include native, video, shopper marketing, programmatic and social. The company anticipates revenue and margin growth in fiscal year 2019. Meredith will also accelerate its effort to grow high-margin consumer-related revenue through its expanded portfolio by cross-promoting brands in an effort to boost revenue and lower subscription acquisition costs. The company plans to leverage affinity marketer Synapse and grow its brand licensing business, while expanding ecommerce activities. As part of its licensing plan, Meredith recently renewed a program with Walmart that extends through fiscal 2021 and features more than 3,000 SKUs of Better Homes & Gardens branded products across 4,000 stores and at Walmart.com, Jet.com and Hayneedle.com. The company also pledged to synergize costs across both Meredith and acquired Time Inc. titles to save at least $550 million within the first two full years of combined operations and reports it is on track to meet its goal. Meredith Corp has also reduced its debt by $700 million as it inches closer toward meeting its goal of $1 billion in debt reduction. The report offered projections for the rest of 2019, during which Meredith anticipates bringing in total company revenues ranging from $3 billion to $3.2 billion. During Q3 of fiscal 2019, Meredith anticipates total company revenues to range from $715 million to $735 million, while its National Media Group revenues will land somewhere between $530 million to $540 million.